This is a sketch by Linda. Here is my take today. Explanations at the end of the post. First, I took a plain, white panel and embossed it with my favourite embossing plate 'Linen' and mounted it directly to the front of a white card base. Next, I adhered a piece of a die-cut grid that I had left over from a previous project. 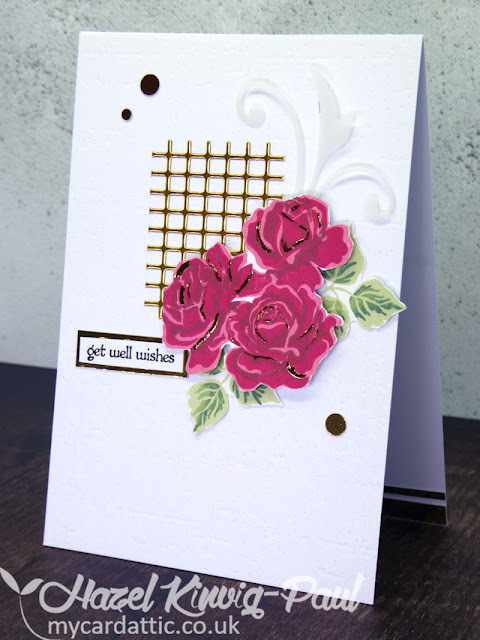 Then I arranged some roses and leaves that I had stamped using a three-step stamping set from Papertrey Ink, adhered the roses with foam tape and then the leaves and a vellum sprig were adhered flat to the card. Finally, I stamped a small sentiment from Stampin' Up (I love this set, it's so useful), adhered it to a matching strip of gold foil card-stock and adhered that flat to the card too. I finished the whole thing off by punching out some gold foil circles, adhering them strategically and did some foiling highlights to the roses. Another superb gorgeous card Hazel. Thank god I didn't forget to alter my clock because I was expected in Holland at 9am to give 3 workshops for 10 people each. But I do have troubles with this hour less sleep. Hope you manage that well. Your flowers are so beautiful and the gold grid work is gorgeous with them! Glad you shared this at FMS! 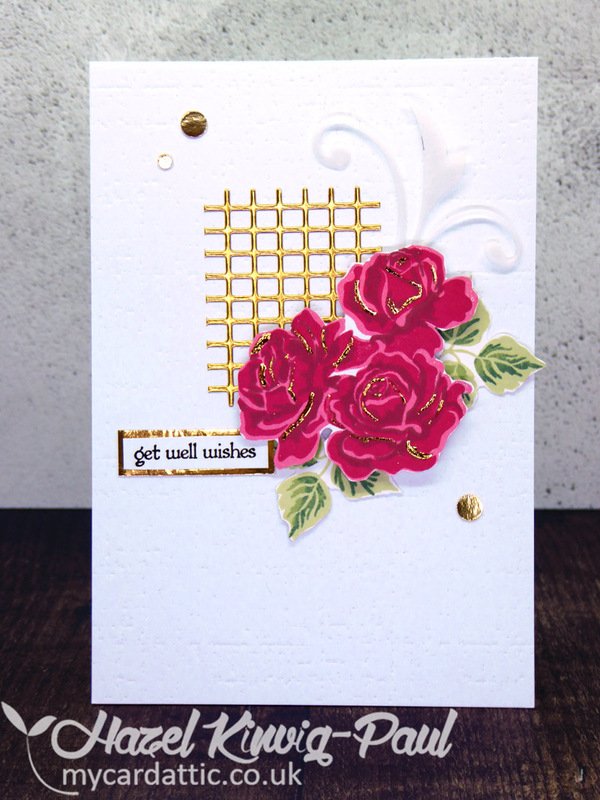 Such a beautiful and elegant card, Hazel! 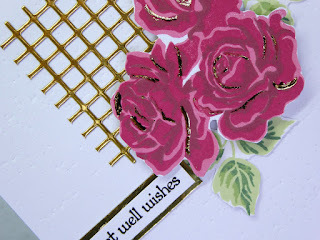 I love the gold highlights on the roses - they just tie it all together. 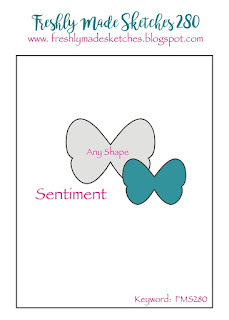 I have a cold, and I feel better just looking at your pretty card! Hazel, what a beauty this is. 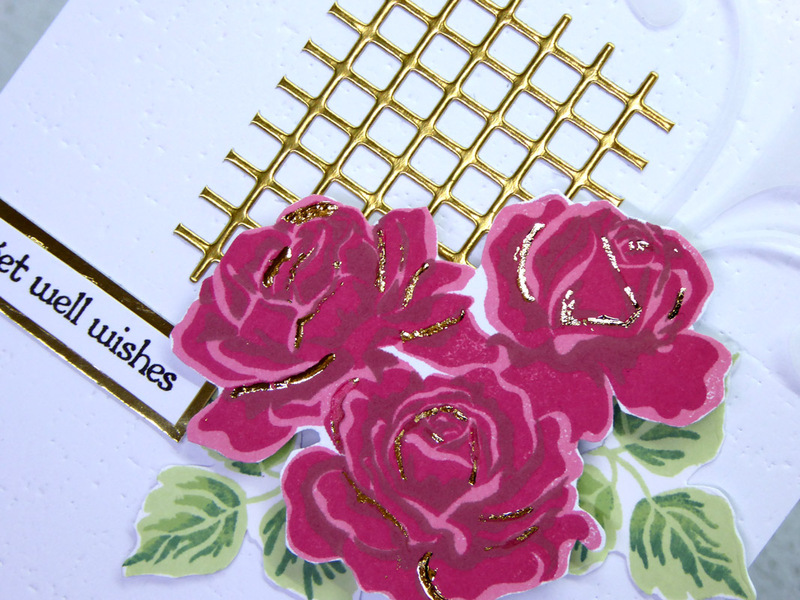 The gold grid and touches of gold on the rose petals take the card a level up. Fabulous. This is such a beautiful card! I love those gorgeous flowers and the hints of gold. Thanks for joining us this week at Freshly Made Sketches! 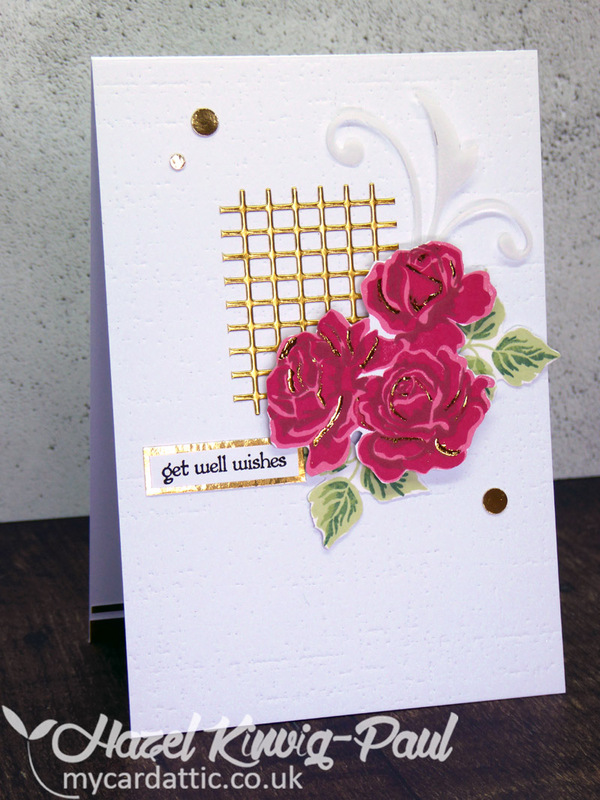 Some pretty roses, gold accents, a bit of vellum, some subtle texture - all this makes for a fabulous card!